Luton striker James Collins wants his side to emulate Portsmouth’s achievements from last season after knocking the League One side out of the FA Cup on Saturday. The forward, who scored the only goal of the game on the stroke of half time, was part of a Crawley side last term beaten 3-0 and 2-0 by a Pompey side, who went on to win the title on the last day. I think we’ve got all the credentials to be like a Portsmouth and we just need to knuckle down in the league. Collins has now urged his new team to replicate the Fratton Park club, as he said: “I thought Portsmouth were the best side in the league by far last year, me personally, and that’s what we want to be this year. “We want to be the best side in League Two, we want to win League Two and be where they are this year. “I think we’ve got the squad to do it, we’ve got the manager to do it, the staff, the fanbase. Collins didn’t think there was any glaring differences on show at the weekend, despite the visitors playing at a higher level this season. 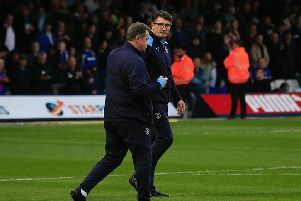 He continued: “If you were a neutral, you wouldn’t have known which was the League One or League Two side, as there was good quality all around. “It was a fantastic afternoon for everyone involved in the club, and I thought it was a really entertaining game. Hatters had been at the summit for two games before they were knocked down into third place by a 3-0 home defeat to Coventry City. However, Town have bounced back well, beating two opponents from League One, AFC Wimbledon in the Checkatrade Trophy last Tuesday and now Portsmouth at the weekend. Collins said: “Any defeat is not easy and it was a hard to take, finishing the month like that. “But like the gaffer has come out and said, it was a good month for us. Standing in Luton’s way of returning to the winning trail in League Two this afternoon are mid-table Cheltenham, as Collins added: “We want to take this performance into the weekend and if we do that, we’ll be okay. “Wnd we need to be right at it, we’ll prepare this week and be ready for next week.